On my way to the dentist one early morning, I suddenly noticed this reflection. I have crossed Kultorvet in Copenhagen hundreds of times. But I have never seen the reflection. I had 15 minutes for shooting photos. I learned the reason why I had never seen the reflection before. just as I was finishing up. It is a fountain, and I had to jump off not to get wet. Fiskettorvet is one of the Shopping Malls in Copenhagen. 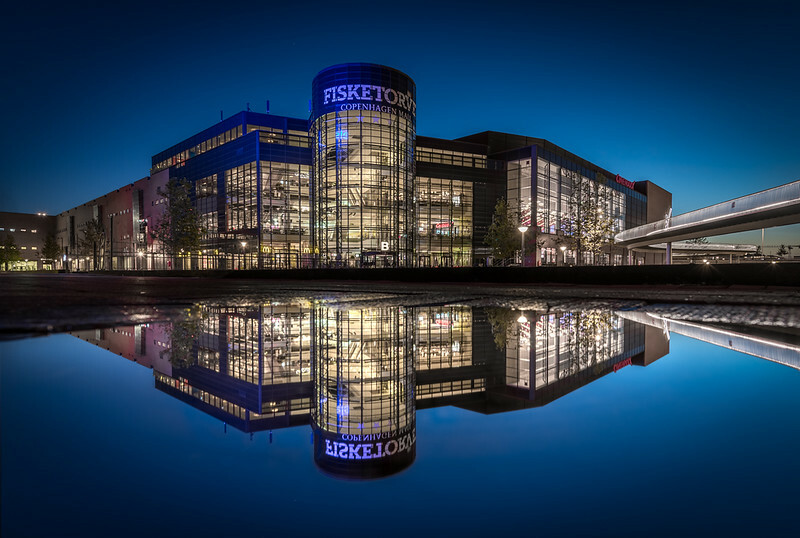 Fisketorvet is one of the shopping malls in Copenhagen. In the beginning it was quite lonely, on the old harbor, but other houses, both residental, and offices has been built around the shopping mall. And now, it is a pretty cool area, especially for photographers! This one is shot literally with the camera standing on the ground. It’s a amazing how clear a reflection in the water can be. I only had to fix a few issues in the reflection. One day, at a conference I sat and played around with my camera. I had my 50mm lens on, and I shot photos of various slides from the presentation. Suddenly I noticed, that if I pointed the camera, at my iPhone, the iPhone would be completely blurred, but what it reflected was 100% sharp. Later I took this photo, which once again is a reflection in my iPhone shot real close with a 50mm lens. Closeup photo of an iPhone. Notice how out of focus the iPhone is, and how sharp the object reflected is. I really wondered what happened and later on the same day I learned why. The glass works as a lens, and for that reason you have to focus from the distance of the ‘lens’ (the glass of the iPhone) to the subject. The iPhone and the camera being very close to each other makes this distance almost the same. And this also explains, why you can put your camera literally on a poodle of water, and reflect completely sharp. Nyhavn (New Harbor) is a beautiful place in Copenhagen. On this particular morning, I saw the craziest wild colored sunrise, but I never saw the Sun itself. I saw it shine on the city behind me, but before it got clear of the horizon, it disappeared behind clouds. Really weird. This photo is from Nyhavn in Copenhagen. 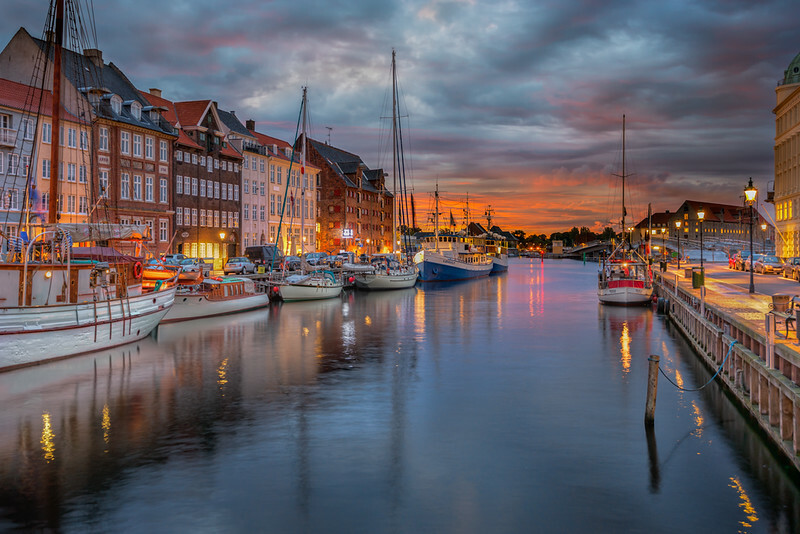 While Nyhavn means New Harbor, it is an old harbor today, only there used to be an even older harbor. Today Nyhavn is the place to go, for a cold nice beer and a nice meal on a summers day. Not only tourists go there. If the weather is great, the locals will go there too, for a beer after work, or just to hang out. 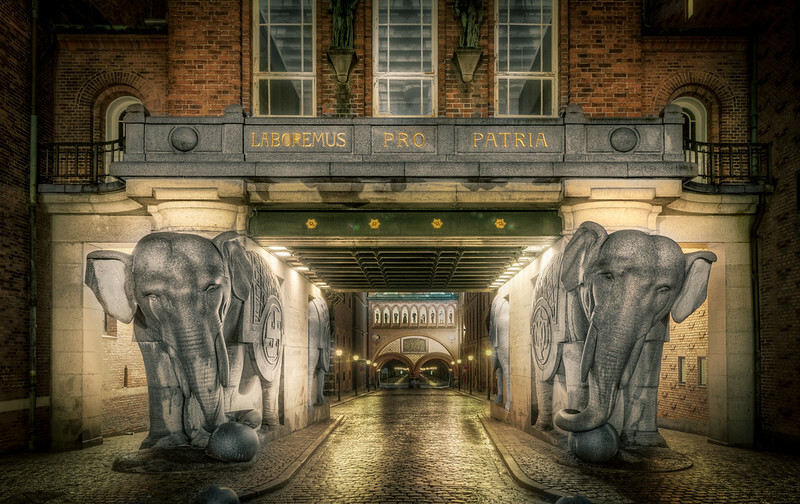 The Elephant Gate (Elefantporten) in the old Carlsberg brewing facility. On my way home from a speech on photography I gave, for a photo club, I drove by the old Carlsberg brewing facility. I knew of the existence of this Elephant Gate, but I had never seen it. I turned the car around and went up there. Despite a light drizzle, I got out and shot some shots. When I post-processed this HDR photo, the Elephants didn’t become as prominent as I had hoped. The lights from the gate it self has a yellowish glow to it, and the elephants, even though they were wet, also had a slight yellow glow to it. I wasn’t quite happy with the photo, and then I did what I often do with a photo, that I feel, hasn’t met it’s potential yet. I leave it. Then I go back a week, a month or even longer, and see if my creativity sparkles. In this case I waited a fortnight, and then I got the idea of increasing the exposure and removing all color from the elephants, and the balcony above them. This way, they get a much stronger role to play in the photo, and I felt that the potential was met, and I was happy. One of the exposures completely unprocessed. As you can see in the image above, the gate in the far end is completely white (blown out). This is because the camera can not capture all light in one exposure. There is too much difference between the light areas and the dark areas in the photo. It is quite dark from where I am shooting while the yard inside the gates in lit up. Because the camera can’t have it in one shot, I did 5 shots and merged them together into a High Dynamic Range photo (HDR), using my HDR workflow (read about it right here). Notice how the gate is in the first image is perfectly exposed while the elephants are completely black. And in the last image, it is the elephants that are perfectly exposed. Combining them, gives an image that is perfectly exposed all over. I as good as always use Photomatix to merge my photos into one. Photomatix does a ‘tone mapping’, which also applies some effect on the photo. And in this case, I took the output of Photomatix and used that as input, and then did a double tone mapped image. There is a button in Photomatix for this. 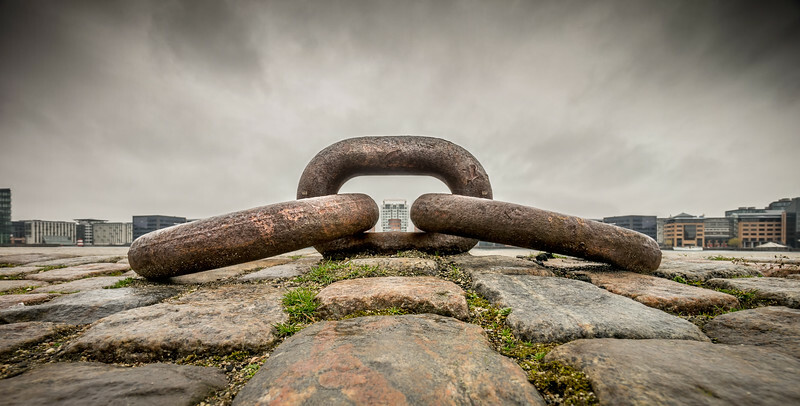 You can read about doing double tone mapped images in this post. The trick is not to overdo anything. The double tone mapped image, will be way too wild and crazy. Do NOT use it straight out of Photomatix. Instead, blending it gently in Photoshop or Gimp, with the original exposures and the single tone mapped image, and you can get a nice effect, as I have on the bricks in this photo. Aller House in Copenhagen shot with a fisheye lens. Bo Nielsen (from www.justwalkedby.com) and I went shooting in the area around Fisketorvet. We were rewarded with quite a lot of great clouds and a rainbow, and a short but intense shower. Some people says rainy weather is not for photography, but I do not agree. Of course, you have to be careful with your equipment. Some equipment is more water resistant than other, but using a piece of cloth and a plastic bag you can do quite a bit in rainy weather if it’s not too intense. A fisheye lens lets you do some pretty wild things, like this close-up, of a tall building. Even standing very as close as I was, I was able to include all of the building. 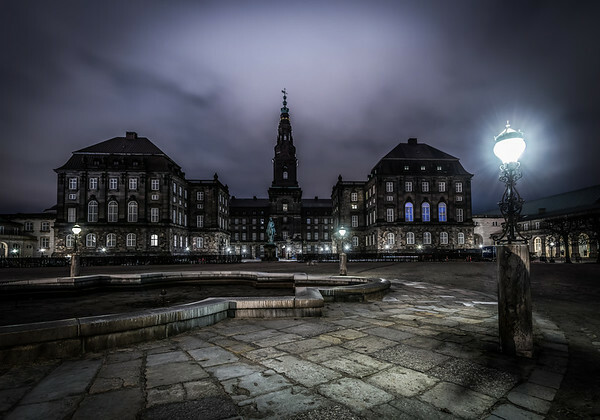 I shot this photo of the Aller House in Copenhagen, using my Sony A7R and my sweet old Nikon 16mm fisheye lens. 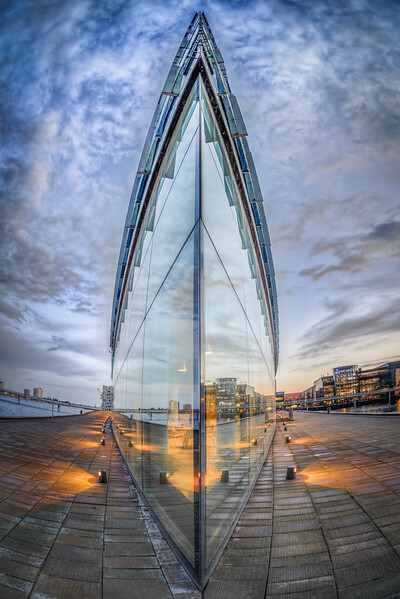 The Aller Building is one of the more spectacular new buildings in the Harbor of Copenhagen. It’s located right next to the shopping mall Fisketorvet. 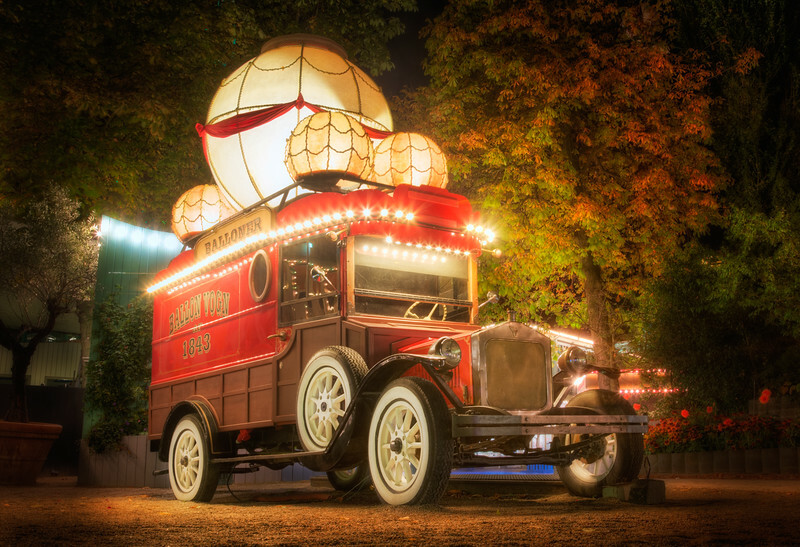 The fairytale amusement park Tivoli Gardens, in the center of Copenhagen, holds many small wonders, like this fantastic steampunk car. I always carry a camera around with me and a small tripod in a very small bag. On a daily basis my normal or even my travel tripods are too big to carry around, and I just have a small Manfrotto tripod. If used carefully, it can be used even by my Nikon D800 and the huge 14-24 mm lens. I must admit, that from time to time, I get shots, I wouldn’t have thought of, but are provoked by my small tripod, and these couple of photos from Tivoli Gardens are fine examples of this. 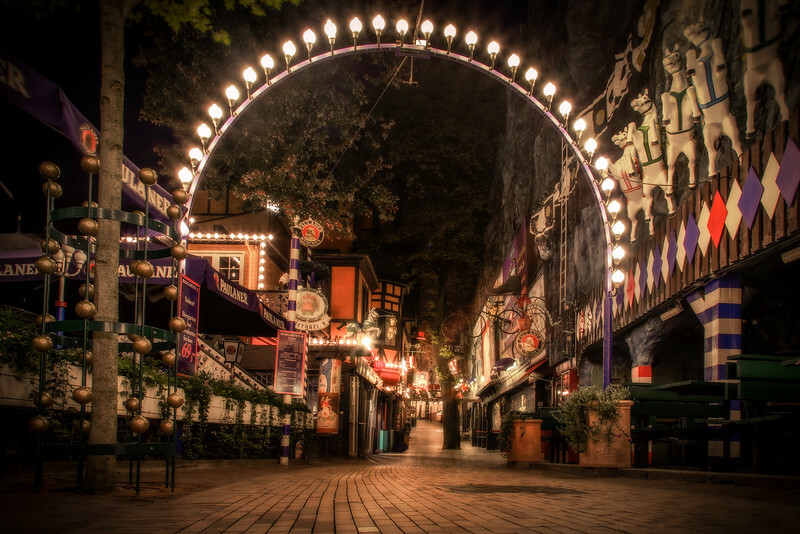 A small alley with a beer garden, small shops and great candy. Is there anything better? Notice how small lines suddenly play a huge part in leading the view up through the alley. Had the camera been higher, the lines would have been less obvious. Using these lines can be really powerful, and this is a stronger example of using very small lines. I arrived too early at work, the day after they had changed the alarm, and I couldn’t get in. Instead I took out my camera and the small tripod, and started shooting. It is the Tivoli Hotel right in the middle. The hotel is placed close to Tivoli Gardens, but not in the garden itself. I did cheat a little bit on the hotel in the middle. It wasn’t symmetric to begin with, and it seemed wrong. And by a simple mirroring trick I made it symmetric, and it was a dramatic change. Now every line in the image points to Tivoli Hotel. 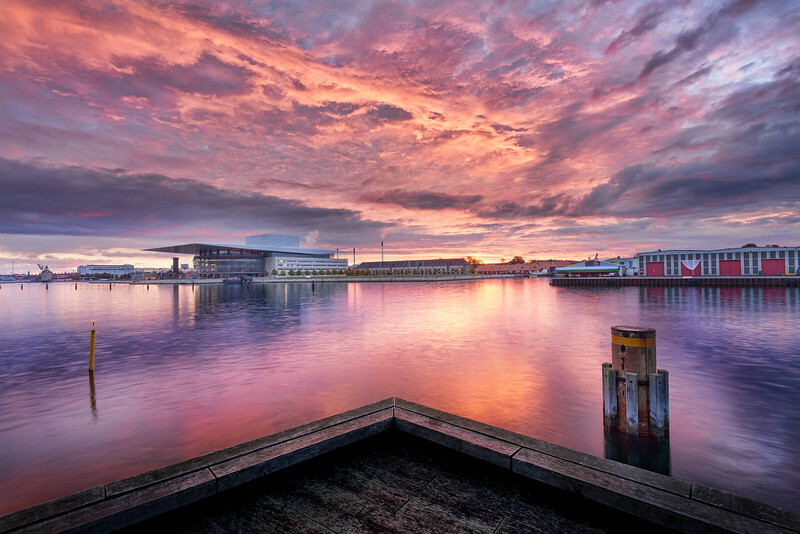 A wild sunrise at the Opera House of Copenhagen photographed at the very climax of it’s stunning beauty. Processed using Photomatix and Photoshop. Getting up really early can be hard, but I find that I am often rewarded by unique experiences, worth getting to experience. A particular morning like this morning started with a drizzle. It was close to pitch dark, and pretty overcast when I started out. The first images I shot, I assumed to almost just dark clouds. But as I processed them in Photomatix very interesting colors appeared in the clouds. The first colors of a wild sunrise, already played around in the clouds. 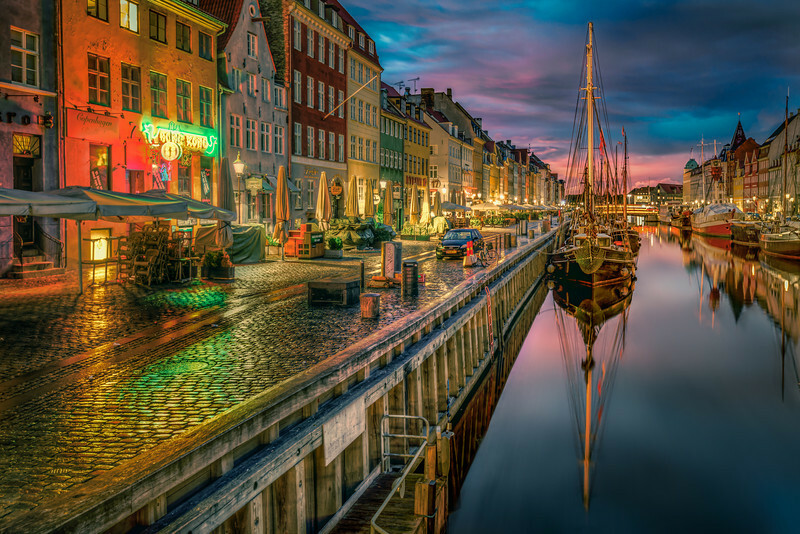 I thought it was almost pitch dark when I shot this image of Nyhavn in Copenhagen, but tone mapping provides wonderful surprises, by enhancing even the smallest hints of colors. In this case traces of purple and pink in the clouds. 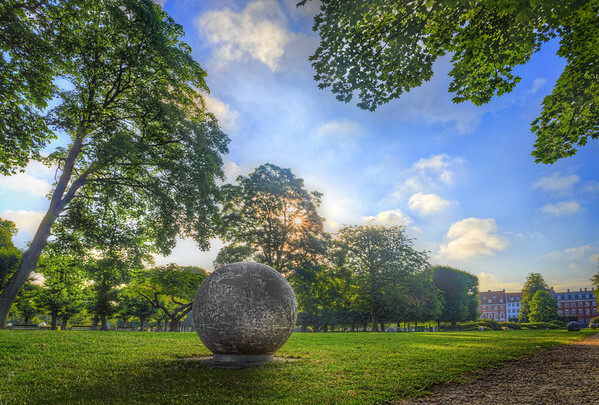 There are no Moeraki boulders in Kings Garden in Copenhagen. They are round stones however only half the size of a real Moeraki boulder. Everyday for the last 7 years I have walked through Kings Garden to get to work. Until a year ago the stones were just round stones to me, but then I started to prepare a long vacation in New Zealand. Along with that, came the knowledge of the Moeraki Boulders. Ever since I have been to the Moeraki beach, these round stones, though only half size, reminds me with great joy of New Zealand. Oh what a wonderful place – I want to go there once more! This is a 5 shot HDR from -2 to +2. The sun I have placed in the leaves, to take some of the strength out of it and then I used a 5 inch tall tripod to get close to the ground. That makes the boulder look quite large and gives the viewer a feeling of 3D in the photo. I processed this in Photomatix and then blended the layers in Photoshop to get rid of nasty halos in the sky (see my too tutorial on blending layers). I wasn’t quite satisfied with the result and have had the photo lying around for some months, without a fixed solution. But then the other day I picked it up again. I added a shadow to the stone, adjusted the light about in the leaves, in particular in the right hand corner. For some reason they kept coming out too black. What I have found out in the mean time, is to use the Dodge and Burn tools in Photoshop. The Dodge tools makes things brighter, where ever you paint, and the Burn tool makes things darker. In this case I used the Dodge tool to brighten the leaves. What’s cool is that, I specify to make the shadows brighter, and then it will leave the bright sky untouched, and that really worked, and I got green leaves instead of black. The previous photo ‘The Royal Stables’ I posted, I shot over at the right hand side of this image. The photos are shot within a few minutes, but as you can see, they are very different in nature. This photo is a single exposure, processed in Lightroom 4. What I have basically done, is to raise the Shadows to 100 and then lower the Highlights to -100. This move made the ‘mood’ of the photo. The next steps I did was fine tuning (using curves), raised clarity a little. The last steps I did was cleaning up in the photo, like removing the shadow from the tripod, removing a nasty green color cast from a lamp. As you can see, the mood is very different from ‘The Royal Stables’ and I like both, they are just different. My idea with composition was both to have a lead in line, using the edge of the bassing, and the second was using the lamp as a kind lamp like the tower on the the building. The lamp seems very large and has much the same shape as the tower. 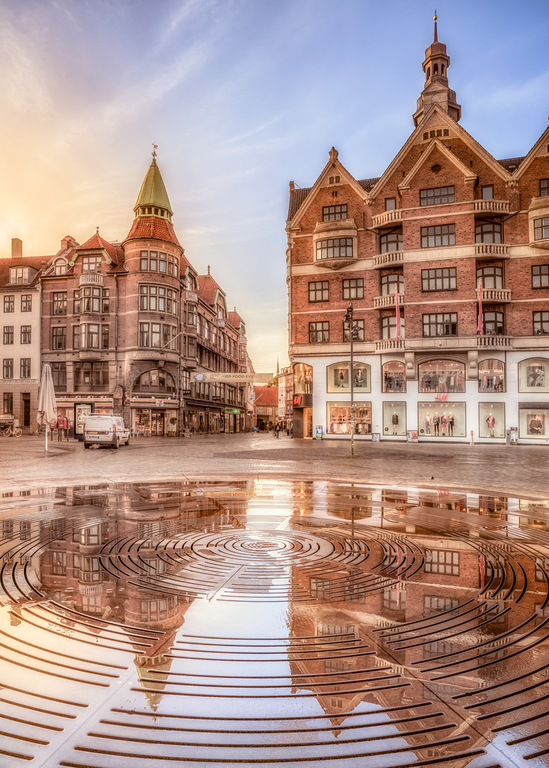 After a barbeque evening at work, I walked slowly through the center of Copenhagen towards the Central Station. 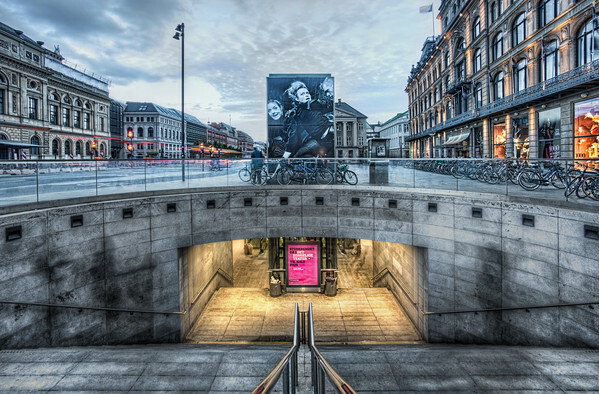 At Kings Square, next to the Danish Royal Theatre (the building on the left) is entrance to the Metro. The Copenhagen Metro is a new one, only about 10 years old. It has driverless trains and a very futuristic look. I may go down at shoot some there aswell. I rested the camera on the rails going down into the metro. This gives strong lead in lines from the rails. The edge of the stairwell also works as lead in lines. Above ground the buildings also works as lead in lines. There’s a lot of lead in lines in this photo. This is a 5 shot HDR photo, ranging from -2 to +2, with one EV step between each. Actually this is the second time I processed this photo. The first time I missed the fact that my camera had moved slightly between two shots. This was visible only in some parts of the photo if viewed at a 100%. This time I made sure, that auto-align was selected in Photomatix. This is a photo with mixed light. Electrical underground and natural evening light above ground. This gives two different white ballances. This gave me a very bluish color to everything outside of the metro. I removed a lot of the blue and cyan colors by duplicating the layer in Photoshop, pressing CTRL+U and then select the blue color. I then turned down the saturation. And then I did the same for cyan. Then I closed the dialog, added a layer mask, and then painted on the layer mask so that I mixed in what I liked from each layer. You can see details about how to blend layers in Photoshop here. There was a lot of trafic of people going up and down the stairs, the guy with bicycle and cars and busses going by. I had fairly long exposures, so everything was kind of blurry, which looks cool with the cars. I waited until there were fewer people and then I was able to combine a complete staircase with no people, by mixing in 3 of the 5 shots. Being an HDR photos I had to adjust the exposure and look and feel of each of the photos before blending it in. If I hadn’t done that I would had light and dark patches of staircase, depending on which photo I used to blend in.